Congratulations to CCM's October student of the month Meran Brito. 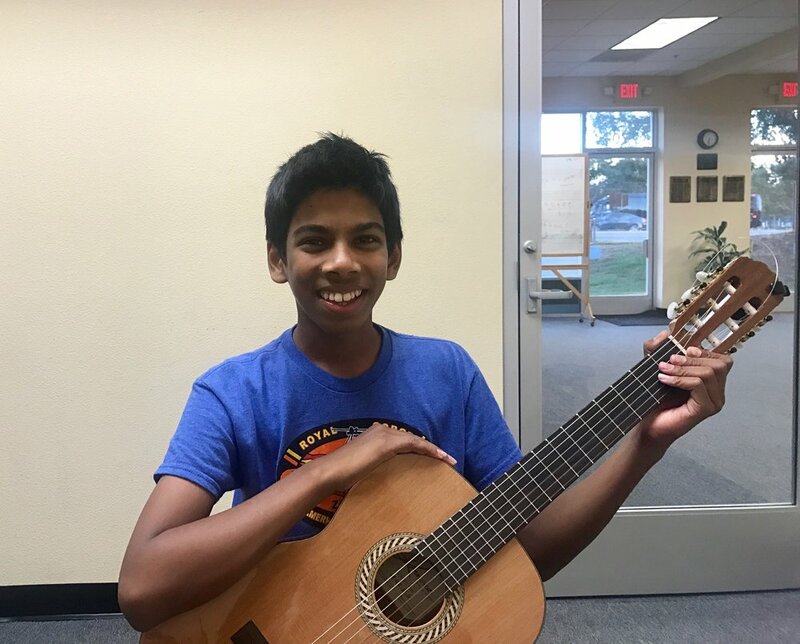 Meran has been a student at the California Conservatory of Music in Santa Clara since the beginning and has loved guitar since his first lesson. Meran is a hardworking student who always comes to his lesson prepared and excited to learn something new! He is currently working towards his one-year challenge. Don't forget to check out his mother, Deepika's parent spotlight below as well as an excerpt of Meran playing Joao Pernambuco's Sound of Bells from Suzuki Book 6. Keep up the great work Meran! What advice would you give to a guitarist just starting out? Get a concept of the whole piece before starting to learn it section by section. What is your favorite food? I like all food. What do you want to be when you grow up? I want to be a scientist and invent the first working time machine. Are there any past performances that stand out to you the most? The talent show in 5th grade, I played Sueno, which I thought was a pretty challenging piece at the time. Why did you decide to give your child a musical upbringing? Music facilitates all round learning for kids. It enhances skills that children need in other areas, since it involves more than fingers playing the instrument. The child has to tap into multiple skill sets simultaneously when learning, I think that's important for brain development. What advice do you have for parents just starting out at CCM? I think initially it's easy to get caught up in wanting your child to do their best and push them to work harder at practice. It works better if you take a step back, and let them take the lead in their musical education. How has guitar impacted your child's life? Meran started playing guitar at 6. I chose the instrument for him, because I love the sound of guitar. I was prepared for him to say that he didn't like the instrument and want to try something else. I was pleasantly surprised when he really took to it. It's given Meran a strong focus on doing something positive that he enjoys. He loves playing the guitar. He's very committed to furthering his music education and practices often on his own accord.